​Fulham remain six points from safety after a disappointing display at Selhurst Park saw them suffer a 2-0 defeat at the hands of Crystal Palace. Neither side offered much throughout the game, but Palace were able to capitalise on poor defending to take all three points. The visitors weren't without goal-scoring opportunities, as ​Aleksandar Mitrovic will be disappointed to have missed with a header following an excellent ball into the box from ​Calum Chambers after ten minutes. It wasn't until the 25th minute that the game really sparked into life, with Fulham defender Cyrus Christie needlessly handling a cross after challenging for the ball with Christian Benteke. Luka Milivojevic maintained his usual calmness from 12-yards to give Palace the lead. 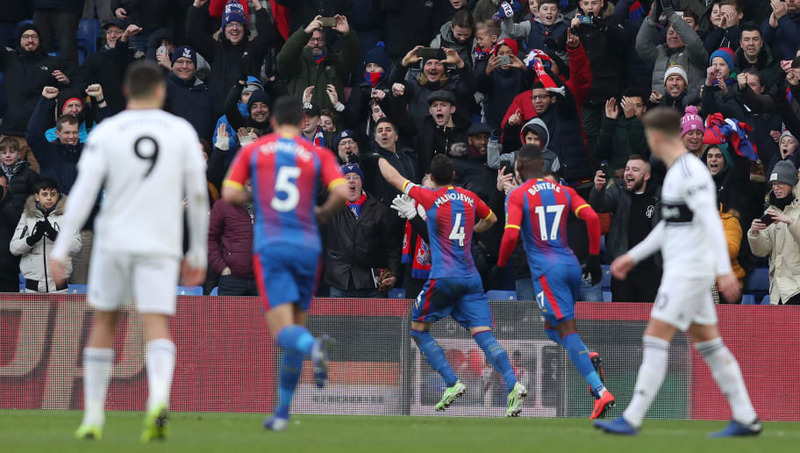 After they took the lead the game belonged to Crystal Palace, the only other remarkable piece of goal-mouth action in the first half came with ten minutes to go in the first half, as ​Christian Benteke's overhead kick cannoned off the bar. The second half told much the same story, as Palace continued to deny ​Fulham any sort of clear-cut chances, despite conceding the majority of possession - the visitors ended the game without a shot on target. The game's second goal came in the final five minutes as new arrival ​Michy Batshuayi beat his man in the area, only for his shot to be parried into the path of Jeffrey Schlupp who doubled his side's advantage. All in all, a very poor showing from a Fulham side who are showing no signs of life in their fight for ​Premier League survival. Up and down the left side like a wind-up toy, didn't stop running until he came off in injury time and thoroughly deserved his goal. A mention too for Andros Townsend, who carried on his recent run of fine form with another impressive display. It just wasn't the Dutchman's day. Flying forward to aid Schlupp down the left hand side as he so often does, but neglected his defensive duties and his final ball was lacking. Fulham had lost all seven of the games they had played against London sides going into this one and were in desperate need of a positive result to try and salvage their season. Unfortunately for Fulham fans, their squad doesn't look strong enough to close the six point gap to safety. Rico (6), Bryan (5), Ream (5), Odoi (6), Le Marchand (5), Christie (3), Seri (6), Chambers (5), Babel (4), Cairney (5), Mitrovic (4). The goalkeeper was the only reason Fulham had any chance in this game. He faced 17 shots throughout the game and his defenders should probably have apologised to him after this one. Didn't look comfortable defending all game, highlighted by the ridiculous decision to throw his arms up in the air when going for a cross with Benteke. He was forced off due to an injury in the second half, and wasn't missed. ​Crystal Palace are looking to continue their fine run (having only lost two of their last seven) with a game against West Ham United on Saturday, who face title hopeful's ​Liverpool on Monday night. Fulham meanwhile, welcome a Manchester United side to Craven Cottage that hasn't lost a game since Ole Gunnar Solskjaer took over in December. Things are looking very bleak for Claudio Ranieri.